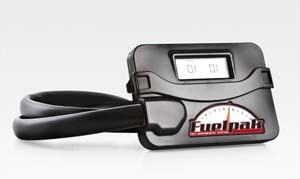 FM-FP3: The Fuelpak FP3 will revolutionize fuel management for all new Harley-Davidson models now using the HDLAN (CAN Bus) system. 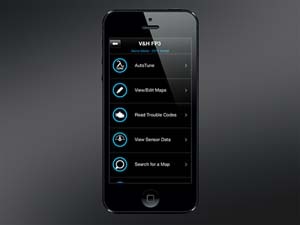 Connecting wirelessly by Bluetooth to iPhone or Android Smartphones, Fuelpak FP3 uses Flash technology to recalibrate engine parameters and mapping for exhaust systems and other performance upgrades downloaded from the expansive library of calibrations developed by Vance & Hines. Fite Touring model year 2014. Also standard for the Fuelpak FP3 is an Autotune feature, making use of all factory sensors to add another layer of precision tuning for specific requirements, whether tuning for unique components or different grades of fuel. 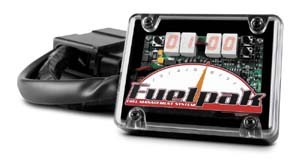 With the Fuelpak FP3 module plugged-in, Live Sensor Data can be viewed through the smartphone to display speed, RPM, cylinder head temperature, voltage, gear selection and other vital information. 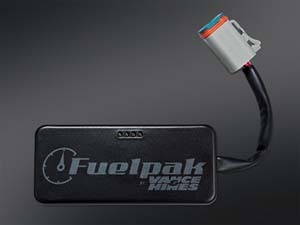 Fuelpak FP3 is compatible with CAN Bus models only (Touring, Softail, Dyna & Sportster). EMISSIONS NOTICE: Fuelpak is intended for racing use only, and is not legal for sale or use in California on pollution-controlled vehicles. EFI-LED/LCD: The total answer to electronic fuel injection tuning. Many Harley owners would like to install an aftermarket set of mufflers and a free flow air cleaner to get the sound they want and an extra ten horsepower that the bikes could use. Misleading information about what needs to be done to the EFI system is what scares most people away from installing aftermarket mufflers and/or an air cleaner, and it's a fact that the stock engine's air flow is restricted and not getting enough fuel, "running lean" in order to meet EPA noise and emissions regulations. Now even stock bikes will see gains in horsepower, run cooler, and run smoother with this module installed. It features easy plug-and-play installation with simple push button adjustments. 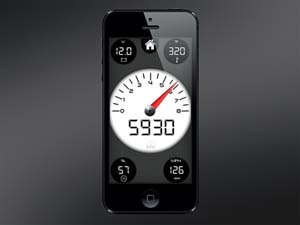 Comes preset for most applications and can be adjusted further by you in seconds. No danger of making a mistake, and if you are not happy with the changes, simply return to the previous setting. No need to go back to the shop for another expensive "download" or connect to a laptop computer like some other units. With the eGlideGoodies' PowerMaster™ EFI Performance Module you can have complete control and the confidence to "dial in" the EFI like a pro. Order one today and get the sound and power you want from your Harley!